EDEN PRAIRIE, Minn. (AP) The Minnesota Vikings took a 6-2 record, control of the NFC North and deep confidence in the depth of their roster into their bye week. The most remarkable aspect of their standing at midseason is that the quarterback situation for the second half remains a mystery. Case Keenum has started four and finished five of the six victories, throwing only three interceptions and taking just five sacks. His 88.8 passer rating ranks 16th in the NFL among players with a qualifying amount of attempts, a middle-of-the-pack statistic that’s better than a bunch of starters around the league who are far more established. His mobility has added a dimension to a vastly improved offense, and his energy on the field has inspired his teammates. With a defense as fierce as the one the Vikings have, Keenum has been the ideal complement on the other side of the ball. So was Sam Bradford, before his left knee started bothering him. So was Teddy Bridgewater, before his left knee was badly damaged in practice 14 months ago to send him down an arduous road of rehabilitation. So what are the Vikings going to do? Bridgewater will be eligible to come off the physically unable to perform list next week once the Vikings return from their mini-vacation. Zimmer said the team was prepared to make that move, but stopped short of promising it. ”Just see where he is at, where the team is at, how Case is doing. The whole deal. 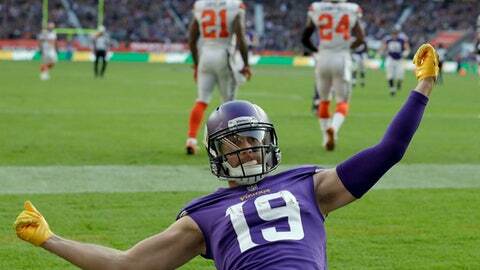 Sam, how he is doing,” Zimmer said. Bradford was brilliant in the season-opening win over New Orleans, which has won five of six games since then, but he’s only played in half of a game because of the discomfort and weakness that has been described by the team as wear and tear from old injuries. Bridgewater returned to practice two weeks ago, taking the field where he dislocated his left knee and tore multiple ligaments in a freak non-contact instant that forced the Vikings to send Philadelphia a first-round draft pick for Bradford right before the 2016 season. ”He’s been slinging it,” said Keenum, who true to form as a career backup has refused to express any frustration about the uncertainty of his status. Having made it this far, Bridgewater will undoubtedly start a game for the Vikings again, and the chance of that occurring in 2017 has significantly increased. Furthering the ambiguity is that the contracts for all three quarterbacks are currently set to expire after the season. ”It’s my job to be the best quarterback that I can be for this team, whatever role that is,” Keenum said. Last year, the Vikings lost four straight games after their bye as the injuries piled up, particularly on the offensive line. They’re already endured their share of health setbacks this season, from Bradford to running back Dalvin Cook being lost for the season to being on their third starter at left guard. While the schedule will stiffen, including five of the next seven games on the road, such adversity is nothing new to this team.